Each spring, I look forward to my first game of the season at Fenway Park. The last three years in a row, I've been lucky enough to get tickets to Opening Day, thanks to my wonderful, beautiful friends who really, really love me. And while the quality of food offered there is sorely lacking, I can never resist the kettle corn sold in the Grand Concourse. The aroma of the fresh popped corn plus the melted sugar is all the advertisement it needs. Of course, it's best when it's still hot, or at least warm, but sometimes all you get is the already-bagged kind which, let's face it, just doesn't compare. I was craving some the other day, and since it is no longer baseball season, I figured I'd try making some, following Jen's recipe on Tiny Urban Kitchen. If you haven't read her food blog before, you should definitely check it out. I knew her personally before either of us started food blogging, and her pictures and the recipes she attempts are leagues beyond my own. Thankfully, this recipe is really quite simple! Put the oil in a pot (ideally a pot with handles and a cover!) and heat to medium high. Put 3 kernels in the oil and wait for the three kernels to pop. When this happens, you know the oil is hot enough. 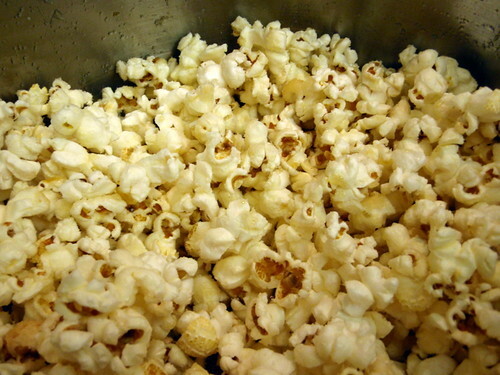 Add the rest of the kernels. They should be spread out in one thin layer at the bottom of the pot. Cover and let pop; it should start popping almost immediately. Start shaking the covered pot around to let the kernels shake around so that the un-popped kernels can get to the bottom where it's hot and also so the popped popcorn doesn't burn. When the popping seems to have slowed down a bit, carefully lift the lid and dump the sugar in. Continue shaking the covered pot around, distributing the sugar and letting the rest of the kernels pop. When it seems like the popping has slowed considerably (1-2 minutes), remove the pot from heat and let it cool. 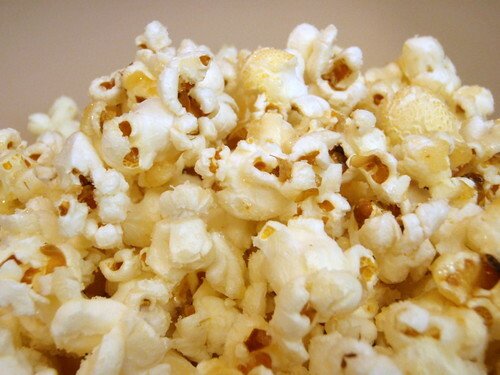 Add salt and stir the popcorn around to make sure the sugar and salt is evenly distributed. Jen mentions that you can use more oil if you want (up to 1/3 cup) and more sugar if you like, but one of the things I like about kettle corn is how the little kiss of sweet and salty makes you crave more. Too much sugar and you might as well make caramel corn. Happy Thanksgiving, everyone! What are you thankful for this year? Me, I'm thankful that I got to travel to a lot of different countries (Czech Republic, Bolivia, Aruba, Italy, Greece, Turkey, and Egypt! ), for new friends that I've made, and that my brother got married to a wonderful girl! I almost always staying in Boston for Thanksgiving since my home in Ohio is really too far away to drive to and too expensive to fly to for such a short break. But it's become tradition to celebrate with other Thanksgiving "orphans", and this year I went over to Oeimae, Yumi (thanks for the invite! ), and Judy's apartment in Brookline for yet another potluck. This time, I wanted to use up the two pears and two apples I had gotten in my Boston Organics delivery, so I decided to make a apple-pear crisp. But just those 4 fruits didn't seem to be enough for the 9"x13" pan, so I bought a bag of fresh cranberries to add to the mix for some color and tartness. 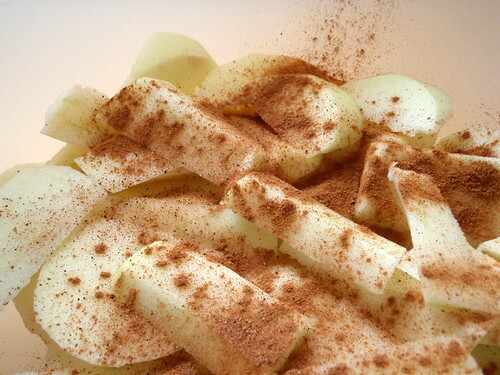 Toss the apple and pear slices with the cinnamon, nutmeg, and 1 tablespoon flour. Add the cranberries and sugar. Toss to mix. Place in a 9"x13" baking dish. 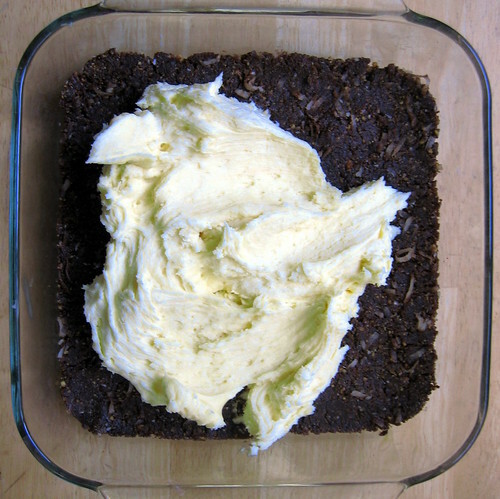 In a large bowl, add the remaining ingredients and cut the butter into the dry ingredients until it resembles a coarse meal. You can also use a food processor to do this, but I enjoy doing it with my hands. Spread the topping evenly over the fruit. Bake for 45 minutes. Serve with vanilla ice cream! That last part of the recipe is key. Even though there's a whole cup of sugar in the fruit filling, the fresh cranberries are really quite tart. Eating this crisp with ice cream mellows out the fruit so that the sum is much greater than its parts. 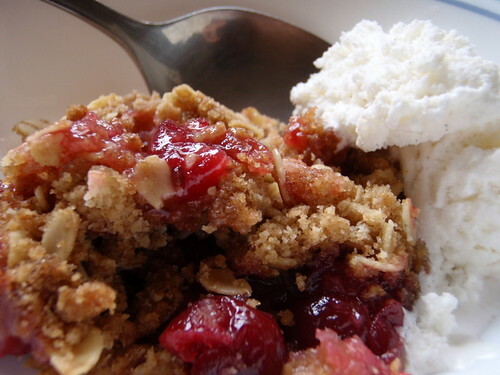 This recipe can be adapted to other fruits as well. You can omit the cranberries and use more of the apples or pears. 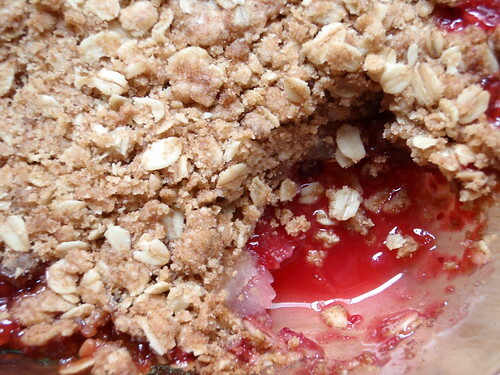 A peach or cherry crisp is another possibility, but you'd have to adjust the amount of sugar since those fruits are already quite sweet. Hi everyone. Yes, yes, I know. It's been almost 5 whole months since I posted. It's unforgivable really. But you see, the reason I started this blog in the first place was because my second love, the Red Sox, were taking their winter break and I wasn't traveling as much for work anymore so I needed something to occupy my time. And well, what do you know, it's that time of the year again! So please forgive me, and get ready to start drooling again! 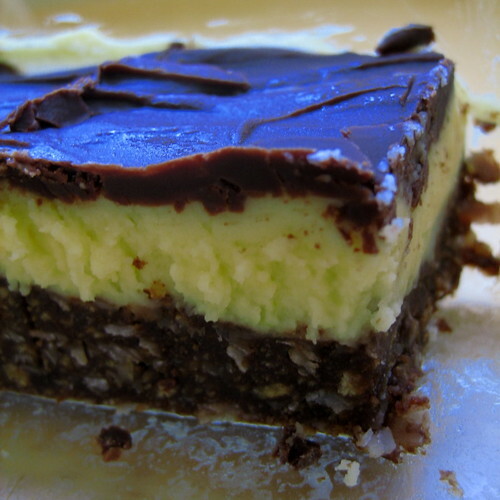 Last week The Kitchn had a post on nanaimo bars (apparently pronounce nah-NAI-mo): a three-layer dessert bar with a cocoa coconut crust, vanilla custard middle, and chocolate top. With over 2 whole sticks of butter in the recipe, what's not to love? And I just happened to have all the ingredients except for the cream in my fridge and cupboard so I decided to make a batch for a pre-Thanksgiving potluck dinner. Melt first 3 ingredients in top of double boiler. Add about a third of the hot mixture to the beaten egg a spoonful at a time to temper. Add the egg mixture to the pot and stir to cook and thicken (roughly 3 minutes). Pay careful attention to the mixture when cooking so that the egg does not curdle. If you start seeing any lumps, immediately remove from heat and keep stirring. 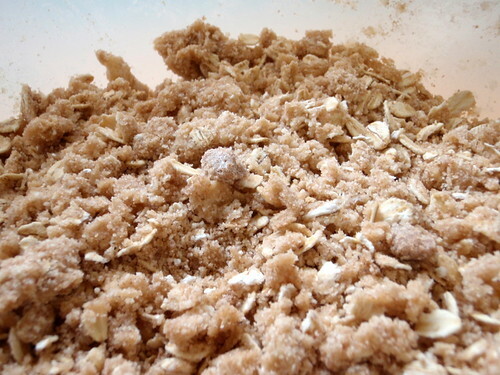 Stir in crumbs, coconut, and almonds. Press firmly into an ungreased 8" x 8" pan. 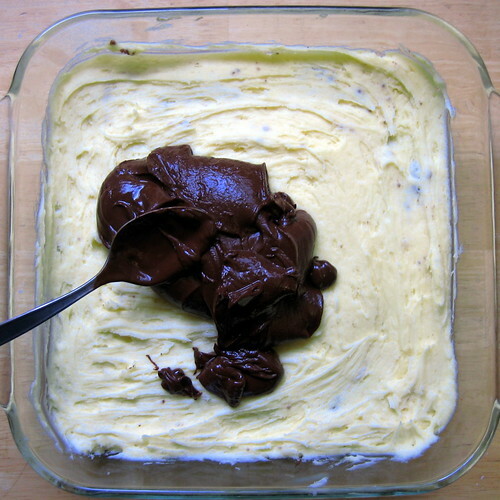 Melt chocolate and butter over low heat. Cool. Once cool, but still liquid, pour over second layer and chill in refrigerator. Cut into 1 inch squares and serve slightly chilled. *A note about the ingredients: the type of cream and coconut was not specified, and I ended up using light cream and sweetened, shredded coconut. And instead of using vanilla custard powder, I substituted with French vanilla instant pudding powder. Also, instead of using finely chopped almonds, I substituted with almond meal. I've never had one of these bars before, so I'm not sure if you could tell a difference in texture. 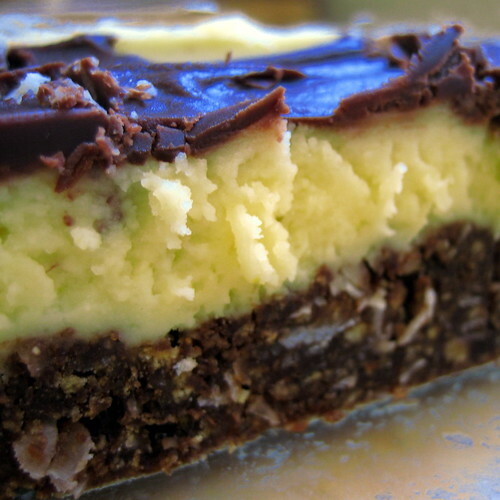 At the potluck, everyone seemed to like the bars, and it was agreed that a 1 inch square bar was enough. As rich as the recipe is, I thought the bars were otherwise a little bland. Personally, I could have used a little salt in the recipe to round out the richness. I think either using salted butter or sprinkling the top with sea salt would've done the trick. Another direction I would go is to add almond extract to the custard layer to brighten it up a bit.